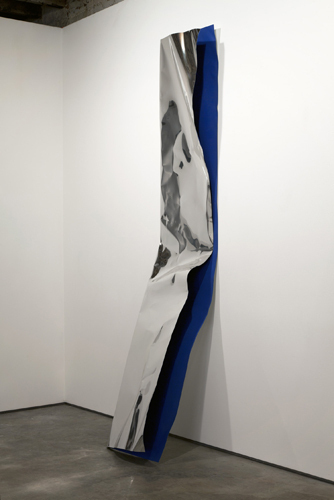 2011, mirrored aluminum and automotive paint, 120 x 24 x 12”. One could make the case that surface has been the main focus of art production since the end of the nineteenth century. In Michelle Lopez’s sculptural works, consideration of the surface is not to be underestimated. She works against the tenants of Minimalism, diverging from the pristine “finish fetishism” of industrial production. In “Vertical Neck”—the show’s title uses a term that classifies a bird and insinuates a posture—Lopez manipulates industrial materials to construct wall sculptures that lean, bringing a sense of humility to the legacy of Minimalist monoliths. Known for wrapping unexpected objects (such as a car) in leather, Lopez has often concentrated on the surface of things. Blue Angel, 2011, consists of mirrored aluminum folded in half vertically and powder-coated on one side in a specific shade of blue automotive paint. The work sags in the middle as if tired and struggling to remain upright, while also demonstrating her expanding attention to the visage. Lopez marks these monolithic structures with scars that imbue a sense of disgrace through the loss of perfection, and she does so by manipulating the materials with her hands and body––literally rolling on the floor with the aluminum. The distorted reflective surface operates like a fun-house mirror for the viewer––doubling the body in the shiny surface like Hans Bellmer’s poupée, with legs reflected both above and below one’s viewpoint. Lopez’s works rest against the wall, unable to stand independently due to a fragility that belies their materiality. She acknowledges a contradiction present in her structures (machismo totems taking on a feminist gesture) as well as within herself, as a feminist taking on a macho discipline. Lopez is wrestling with the history of sculpture as well as with identity politics, which remains a vital field for exploration and struggle.